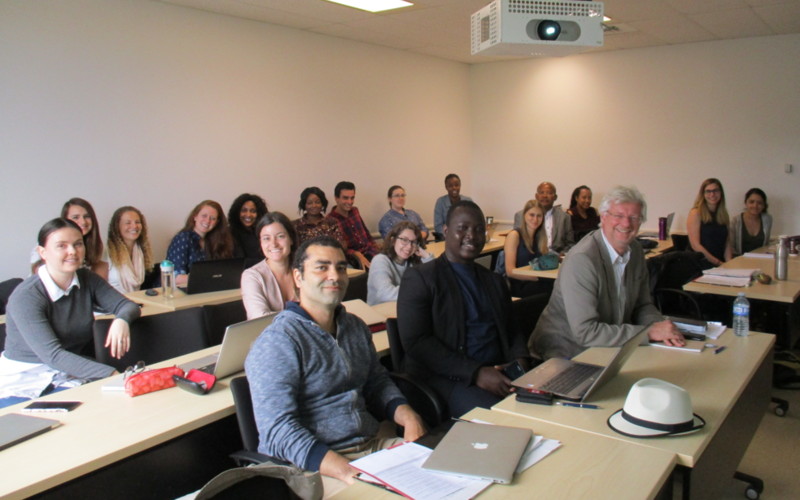 June 2018 – The first edition of the International Justice and Victim’s Rights Summer School, organized by the Canadian Partnership on International Justice (CPIJ) was a success. Held from June 4 to 9 2018, it gathered many world-renowed experts and motivated students. Each day was full with two three-hour lectures given by experts, namely: Jo-Anne Wemmers (Université de Montréal), Valerie Oosterveld (Western University), Frédéric Mégret (McGill University), Amissi Manirabona (Université de Montréal), Jonathan Doak (Nottingham Law School), Isabelle Daignault (Université de Montréal), Mark A. Drumbl (Washington and Lee University), Michel Seymour (Université de Montréal), Stéphan Parmentier (Leuvens Instituut voor Criminologie), Fannie Lafontaine (Université Laval) and Philippe Tremblay (Avocats sans frontières Canada). The lectures were followed with evening activities such as the visit of the Raoul-Wallenberg Center including a meeting with the Honourable Irwin Cotler, a meeting with the CCIJ’s Legal Director Amanda Ghahremani, and the presentation by Paulo Estrada of its film Sin Miedo.